New York University convinced a federal judge to dismiss several challenges to its retirement plans, but claims attacking the plans’ record-keeping fees and actively managed funds are moving forward ( Sacerdote v. N.Y. Univ. , 2017 BL 299499, S.D.N.Y., No. 1:16-cv-06284-KBF, 8/25/17 ). The school must face claims that it acted imprudently under the Employee Retirement Income Security Act by allowing the record-keeping fees it paid to TIAA and Vanguard to get out of hand, a federal judge ruled Aug. 25. The plan investors also advanced claims that the plans included actively managed funds with no “realistic expectation of higher returns.” However, the judge dismissed many other challenges to the school’s plans—including the allegations that NYU chose expensive share classes and stuffed the plans with too many funds altogether. 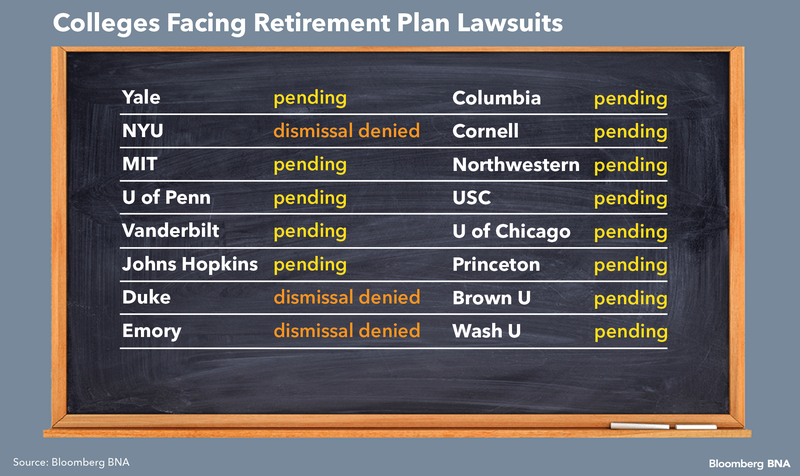 NYU is one of 16 prominent colleges to have been hit with class actions challenging the fees and investment lineups of its retirement plans. Two lawsuits have seen early success, with judges green-lighting many claims against Emory and Duke. In all three cases, courts have refused to dismiss allegations that the schools were wrong to use multiple plan record keepers and to offer two specific TIAA funds that allegedly performed poorly despite carrying high fees. By contrast, both NYU and Emory defeated challenges to the plans’ large investment lineups, while the judge hearing Duke’s case said this claim could move forward. This ruling in NYU’s case may have implications for a pending case against Columbia, as both cases are being heard by Judge Katherine B. Forrest of the U.S. District Court of the Southern District of New York. Similar cases are pending against Yale, Vanderbilt, Johns Hopkins, Cornell, and Princeton. The “common thread” running through these cases is the importance of fiduciary process, Brian M. Pinheiro, a partner with Ballard Spahr LLP in Philadelphia who advises retirement plan sponsors, including higher education institutions, said. For example, using multiple record keepers isn’t necessarily a violation of ERISA—but it can be if it wasn’t the result of prudent decision-making, Pinheiro said. Thomas E. Clark Jr., an ERISA litigator and of counsel to Wagner Law Group in Boston, agreed that these university lawsuits centered on questions of fiduciary process. “I’m not surprised at all to see different judges look at the allegations and come to different conclusions,” Clark said. With respect to the allegations of overly large fund lineups—NYU allegedly offered more than 100 funds in one of its plans—Pinheiro said these claims might be more successful if they included factual allegations showing that plan fiduciaries weren’t properly monitoring all the plans’ funds. Pinheiro and Clark aren’t involved in this litigation. Judge Forrest trimmed many claims from the lawsuit against NYU, including all claims under ERISA’s prohibited transaction rules and its duty of loyalty. The disloyalty claims failed because they included no indication that NYU acted to benefit itself or some other party over the plan participants. To state an ERISA claim for disloyalty, “a plaintiff must do more than simply recast purported breaches of the duty of prudence as disloyal acts,” Forrest said. Forrest also rejected the idea that NYU acted imprudently by offering more expensive retail share classes instead of identical institutional share classes available at lower cost. Offering retail share classes isn’t necessarily imprudent, Forrest said, because retail shares offer “higher liquidity” than institutional investment vehicles. However, Forrest allowed the investors to move forward with claims accusing NYU of offering expensive and poorly performing actively managed funds, instead of readily available alternatives. Schlichter Bogard & Denton LLP represents the investors. DLA Piper LLP represents NYU. Text of the decision is at http://bloomberglaw.com/public/document/Sacerdote_v_NY_Univ_No_16cv6284_KBF_2017_BL_299499_SDNY_Aug_25_20?doc_id=XG1N95OG000N.